I have recruited two authors to write short stories for my next novel ‘Claymore’ (one of them is a maybe). I also sent an invitation to Gavin Parish but it is too soon to know if he accepts. 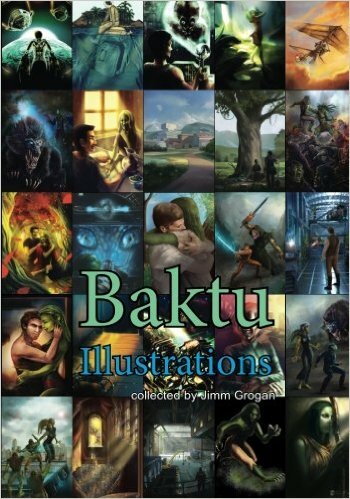 With my last novel ‘Baktu’, I had three short stories added to the book’s appendices, written by independent authors. These stories focused on back stories for minor characters. I gave the credit to the author at the top of each story. It was a lot of fun for me and I thought the stories were great and added a valuable dimension to the book. So I decided to do the same with ‘Claymore’. I expect it to take four to six weeks for all my planned illustrations and short stories to be done (by freelancers). The novel itself is done except for grammar edits. In parallel, I need to start planning the book cover. The second chapter to have an illustration is Chapter five. I plan to post on this blog each Monday or Tuesday until Claymore is published and include a chapter illustration with each post. In this illustration, Claymore is presenting his bill to the legislature of the Azten Empire. He is pushing for more resources for government law enforcement agencies to take the pressure off citizen vigilante work and to create reliable justice. Good luck with that Claymore. 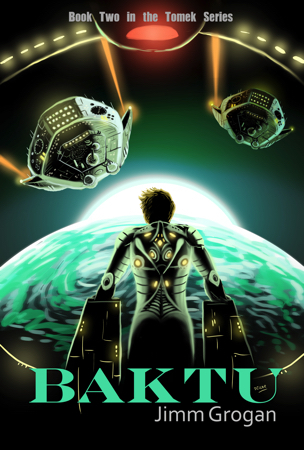 After what what seemed like forever to me, I have finally published the kindle edition of my book Baktu. It took a while to have all the illustrations created. Now, it is available on Amazon.com here. The two paper editions will be available this week. There will be a cheaper black and white edition, and a color edition. All 33 chapters except two have illustrations, and two of the appendixes also have illustrations. 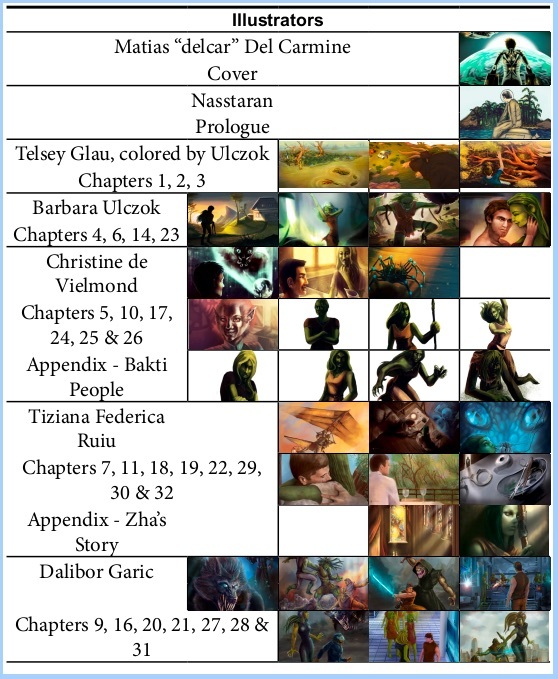 See the small thumbnails of the illustrations in above excerpt from the acknowledgments page. I hired eight different illustrators, each with a different style. It was fun having different visual interpretations of the chapters from each of them, and hopefully it won’t be too confusing to the reader. I am excited to show their work. After the fact, I see I forgot to acknowledge one important illustrator: GrayCactus, who illustrated chapters 8, 12, 13, 15 & 33. I don’t know how I missed that. I will need to update the kindle edition of the book to mention Gray Cactus in the acknowledgements in a couple weeks, and hopefully add the two new in-progress illustrations while I am at it. Also, I really like the short stories in the appendixes of the book. These were written by other writers (not me) and they did an excellent job for me. Each of the three short stories revolves around a different minor character in my book. I think each add some depth to the Baktu world. I am thankful for these writers participation. It is nice to have this project unleashed into the world so I can finally show it to those who have been waiting, and I can turn my attention to the future big thing. I am making slow progress on my novel ‘Baktu’ which is the sequel to ‘Negative Zero’. I believe I am over half way through the last major revision of the manuscript. I am still hoping for a July publish date, but it may be August. It has a prologue, an introductory chapter for new readers, or segue chapter for readers of Negative Zero. 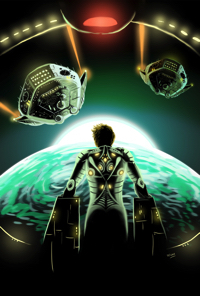 I put on a contest at freelancer.com for an illustration for the prologue. I was happy with the results. I picked the $100 winner and selected four runner-ups and bought their illustrations also for $50 each. 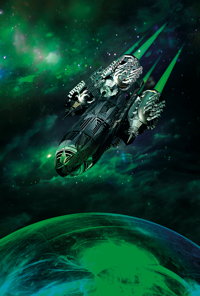 The subject of the prologue is Tomek in his damaged spaceship being confronted by two elite imperial ships for trespassing in a forbidden area. After some resistance he puts on his space suit and escapes in his escape pod designed to look like debris when his ship explodes. He makes a hard landing on the forbidden planet Baktu. The problem, as should be expected, is that the illustrations do not agree with each other on how Tomek and his spaceship look, and the art styles are different. Otherwise I would want to use them all and make a heavily illustrated prologue. I still want to, and am trying to think of a way to present them in the book without confusing the readers. Maybe in the preface or the acknowledgements I could explain about the contest and the different interpretations of the prologue scene by the artists. The featured image above is the $100 winner by Matias “delcar” Del Carmine (MatiasDC). I enjoyed the dramatic wow effect. This was also a favorite of my friends and family. It shows Tomek in combat with the two enemy ships. For ship illustrations I asked for signs of damage. The red warning light above Tomek is intended to be the sign. The planet Baktu is visible, with an apparent sunrise or sunset going on. Next is a second opinion on the interior by Abdulrhman Zaki (Abdulrhma). This shows a situation similar to the previous illustration. However this illustration show lots of cool gadgets and console busyness which is attractive to most science fiction readers. I like it. It also shows a warning projected onto the window, and a ‘loading’ bar which I assume shows the progress of the laser charging. In the prologue, which the contestants had access to, Tomek’s damaged laser cannon takes a long time to charge up, and is a issue in the sequence of events. The planet Baktu, and its moon is further away, so I expect this moment is earlier than the one in delcar’s illustration. The next two illustrations are both by dienel96. One is the picture of the exterior of Tomek’s ship. This is different than the description of the ship in ‘Negative Zero’, and shows no sign of damage. But it still looks cool. The clouds in the background seem unexpected to me, and not quite plausible in outer space. But then I decided that the Baktu solar system was near a nebulae. Besides, it looks cool and added a mysterious exotic mood. The aurorae borealis going on down on the planet was interesting too. 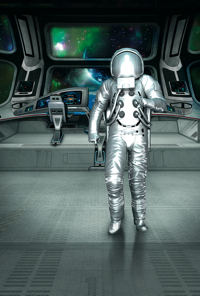 The other picture by Dienel96 shows Tomek in his spacesuit headed for the escape pod. Here is another interpretation of the interior and the console. The console is cleaner and more organized here. The cockpit looks big, larger than I envisioned; you could dance in it, artificial gravity permitting. It looks like it would be more pleasant as a longer term home. I’m sure he was sad to leave it behind. 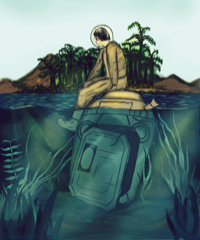 Lastly, in the chronology of the prologue, Tomek is marooned on the surface of the planet Baktu, and the scene is set for the remainder of the book. This last illustration is by nasstaran. So I get a picture of Tomek on the surface of Baktu. Here he is sitting on top of his escape pod figuring out what to do next. This picture is not as flashy and glamorous as the others, but I like it. I like the plants, the details and the moment specific to a moment in the prologue. I like the lonely and tentative mood.